Pre-heat the oven to 220 °c. To roast the tomatoes, place them in an oven dish, drizzle with the Balsamic vinegar, a little oil and season with salt and pepper. Place in the hot oven and allow to roast for 20-25 minutes until blistered. Wrap the whole heads of garlic in foil and roast alongside the tomatoes until soft. Once soft, squeeze the garlic from the skins and keep aside. When the tomatoes are cooked, place them in a small saucepan along with the garlic puree. Add the 1/3 cup olive oil and season to taste. Allow to cook over low heat for 5 minutes, allowing all the flavours to mingle. 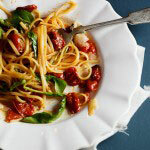 Toss the sauce with the cooked pasta and fresh rocket and serve with fresh Pecorino scattered over the top.